Surprise! I am posting a day early. In case you are wondering, this post is not about the live-action Beauty and the Beast, which I must admit I am having some difficulty getting my mind around. I did, however, like the animated Beauty and the Beast and the live-action Enchanted, so this new film could turn out to be the perfect escapist entertainment that I am craving right now. This post is about breathing new life into an old piece. I bought this tweed jacket from JCrew in 2009. You may wonder why I remember the year so well? 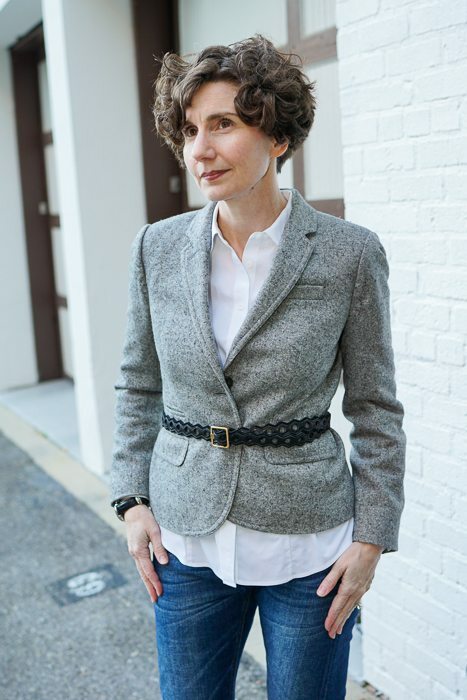 I remember because I was wearing this jacket when I had to make not one, but two trips to the U.S. District Court for the District of Columbia in one day to see that a complaint was timely filed. Suffice it to say, that when a partner is chatting face-to-face with the clerk of the court to ensure that a complaint will be docketed before 4:00 p.m., something has gone off the rails . . . I remember it like yesterday. 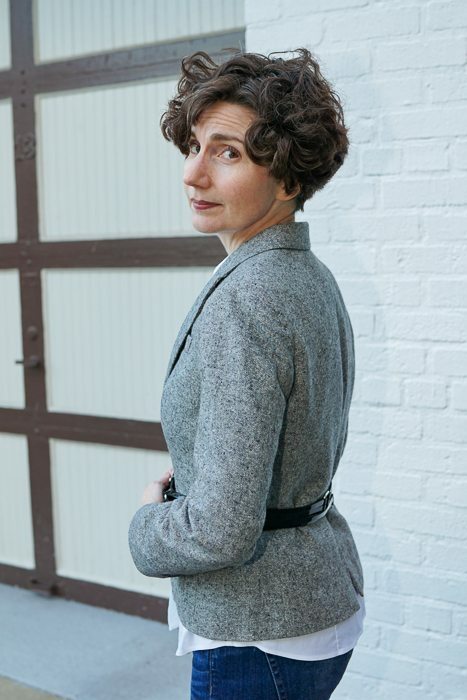 Things I like about this jacket very much: it’s tweed; it’s soft (some tweeds are stiff or scratchy); it’s subtle; it’s comfortable. But it’s a little boxy. Last week I had an idea: I could belt it! This idea dovetailed nicely with another idea I had a couple of months ago: I should up my belt game! I ordered a few belts from YOOX that looked interesting and these are the results. First, a skinny, strappy, double belt in black patent leather. 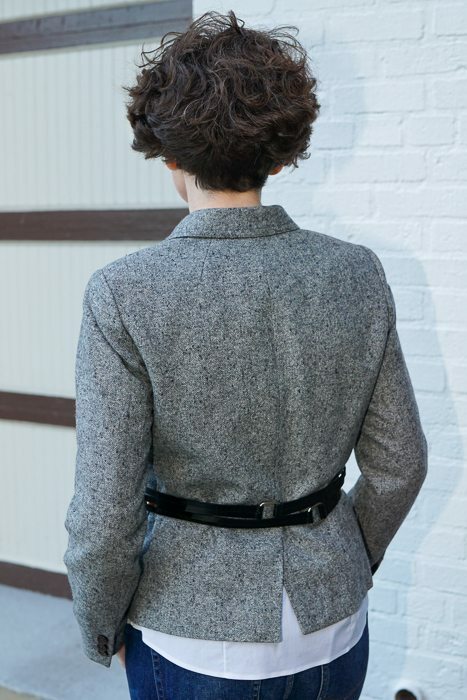 This belt looks like a pair of belts — and from one side may look like even more than that — but it’s all one belt. It took me a little while to figure out how to buckle it and I did have to have a few extra holes punched, which may mean I did not figure out how to buckle it correctly. Regardless, chic — right? 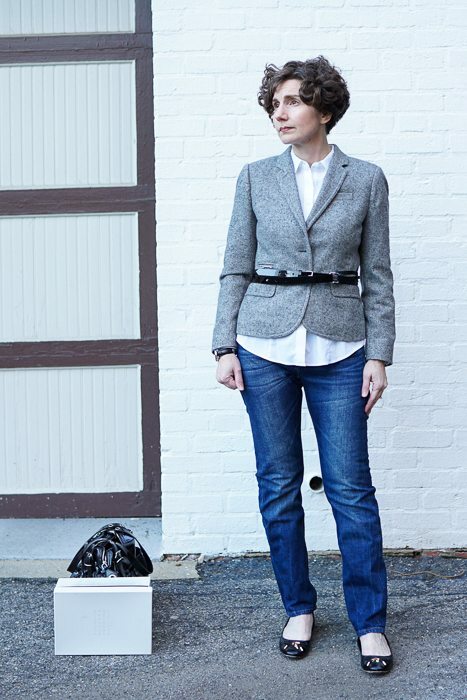 I just tossed on this blouse and these jeans for the purpose of photographing the jacket with belts. 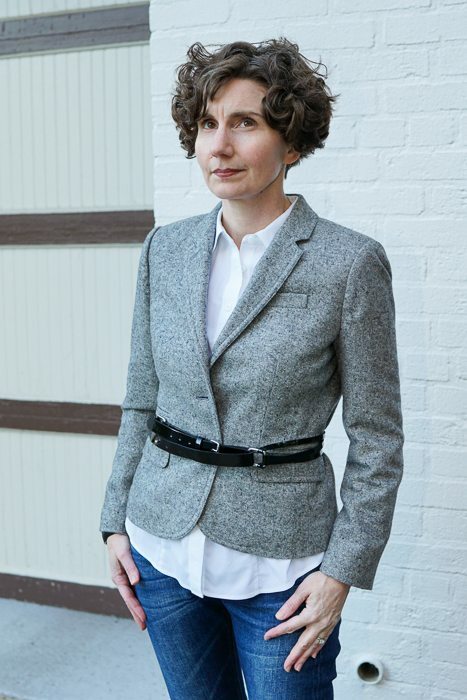 Not sure I would wear this particular blouse out-and-about; I generally prefer a straight hem if the hem of my blouse is longer than my jacket. Do you want to see a bigger picture of the belt? This red belt is my favorite. It’s patent leather, which you know I love, and styled like the self-belt of a trench coat. I should be so lucky as to have a red patent leather trench coat. Be advised: the knot is faux. Operationally, this belt works like a cummerbund and snaps in the back. Is a red patent leather trench waiting for me in the after-life? Allow me to show you the back. Last, a fairly simple black nubuck belt — although even this belt is not plain. The edges of this belt are scalloped and it’s perforated its entire length. No need to punch extra holes here! As silly as this may sound, I am deriving a lot of satisfaction from this styling trick. Sometimes a small change makes all the difference. So sorry, but the none of the belts work for me! Usually I LOVE your modifications but this time, I prefer the jacket without any changes. 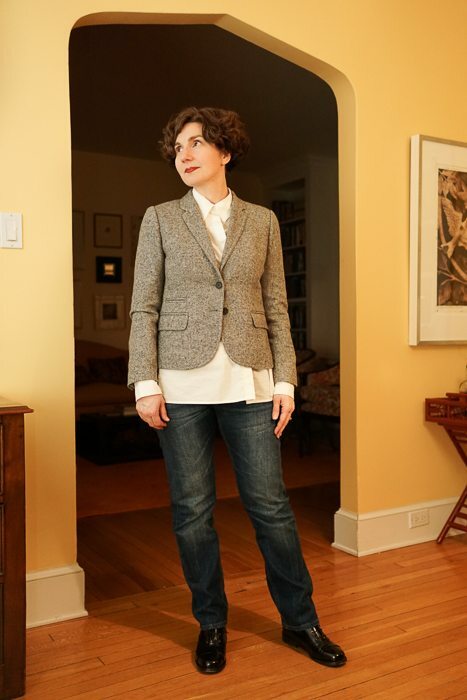 To breathe new life into your old jacket, shortening the sleeves might be cute. I like the red belt, it really changes the look, but I like it! 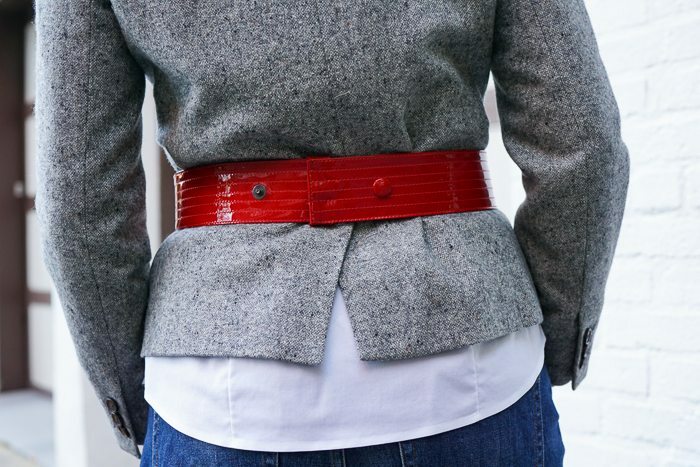 I love a belted jacket (on other people), and prefer the tricky double/triple belt. The red patent belt needs a little more volume under it, to my eye. It overwhelms the tidy jacket. I also like “batting cleanup” as a metaphor for your anecdote. I will remember that one! So much to love here. First, love that belting trick (on others — on my hourglass frame it’s usually a disaster) and the hit of red is great. The Directrice looks fierce! Second, “cummberbund” sounds so much like “Cumberbatch” that I got all excited for a minute there. And last, I have such not-at-all-fond memories both as a litigation paralegal and associate of races to the courthouse last minute — though my experience was the inverse of yours: things went off the rails at the partner level, and the rest of us underlings were scrambling around as a result. A good reminder why I went into transactional work! 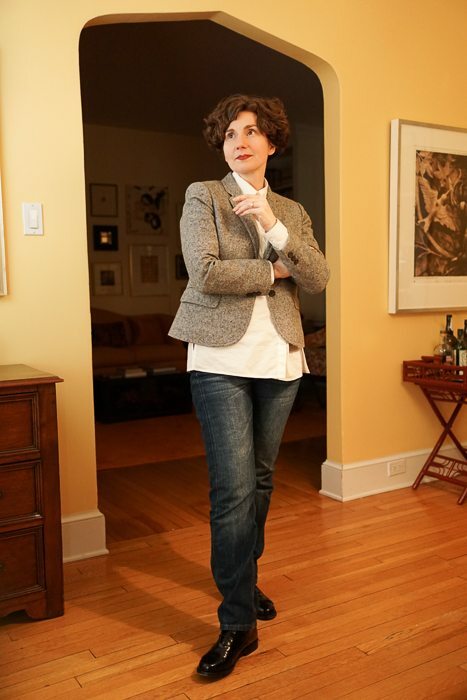 Fewer crazy deadlines and less need for blazers generally. 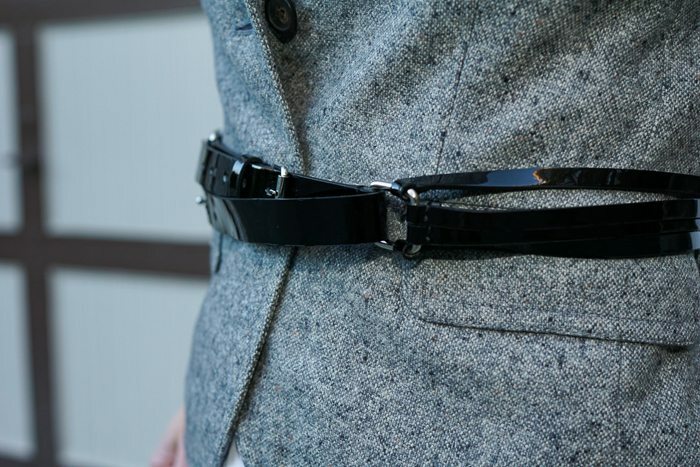 I like it with the first option, the black double belt. I can’t make up my mind about the red, although that’s a great color with that jacket and the other neutrals you’re wearing. I’m curious, would you consider putting darts in the back of the jacket? To just nip the waist in a tad (but so much it creates a peplum) to make it more fitted? I can see it has them on the front (and some nifty ones at the collar on the back) but I wonder if you could overcome the boxy with a slight nip in the waist? JCrew does have this odd habit though of making things boxy and short. But then they’ll throw in some awesome detail like the sequin applique you showed us, or the darts at the top of this jacket’s collar. I like the narrow belts. They certainly bring the jacket to life and update it from a boring corporate look. Unfortunately, some of us don’t wear belts well (short waisted, thick middle) but I appreciate them on others. I like the rounded hem of the shirt tail, it adds a little extra visual interest. 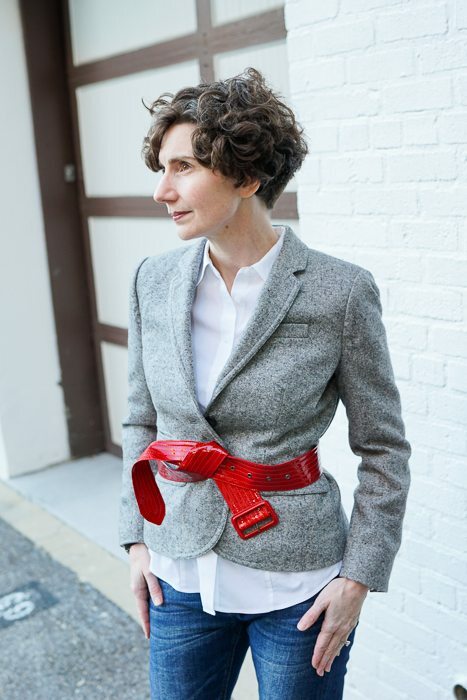 Belt, schmelt – I adore the blazer itself! The addition of belts do feminize the shape, but I also kind of like the androgynous vibe of the boxy shape. 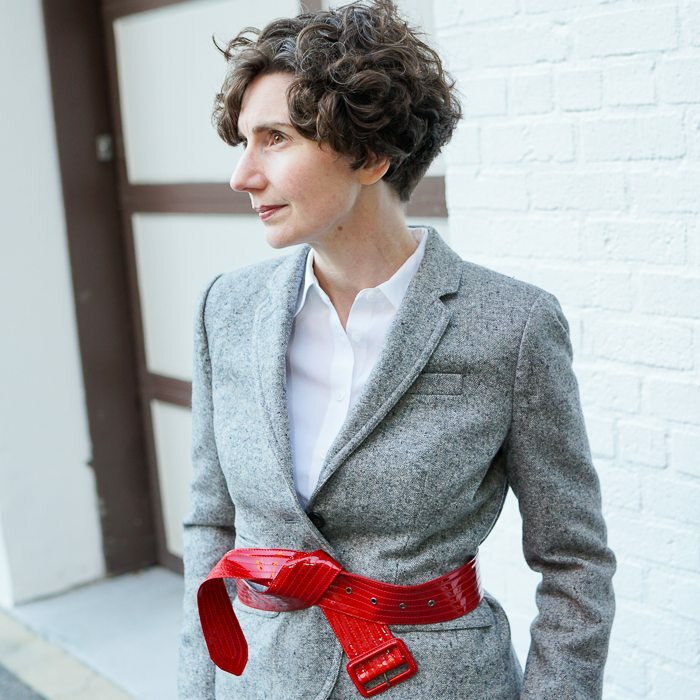 I like the jacket itself very much and in all the iterations you show (if pressed, the double belt is my least favourite for this particular jacket, tho great in itself); the red belt is pure delight! Don’t you want to lick it, if you would taste the buttons from the last post? You would think I might, based on my previous disclosures, Jessica! 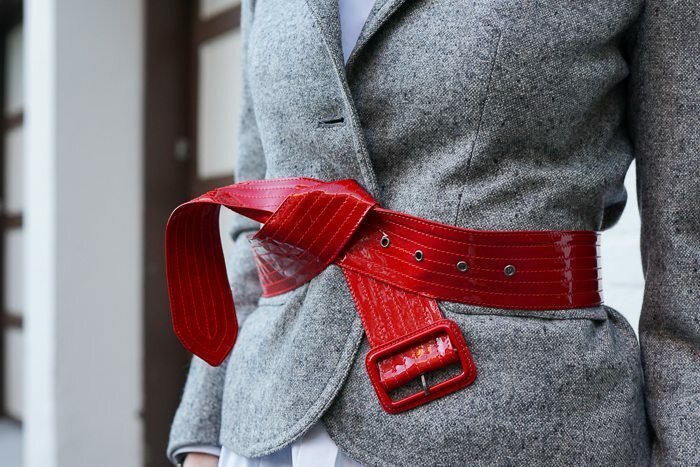 But for some reason the red belt is ALL VISUAL for me — once I start looking at it, I find it very hard to look away.